The combination of falling inflation, weak wage growth and 'mixed' activity data have led financial markets increasingly to doubt the prospect of Federal Reserve interest rate hikes. The lack of progress on either the tax reforms or the infrastructure spending splurge President Trump promised hasn’t helped either. However, we are now at the point where the difference between what the Fed believes it will have to do to achieve its dual mandate (maximum employment and 2% inflation) and what the market believes the Fed will implement has become a vast gulf. For now, FOMC members believe they will have to raise rates once more this year with three further 25bp rate hikes in 2018. 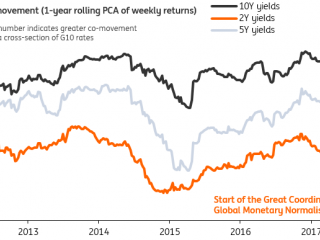 In contrast, interest rate futures are pricing in barely one rate hike over the next eighteen months. It looks as though it the lack of price pressures in the economy that is the main reason for the divergence. So what does the data say - and crucially where's inflation heading next? Headline consumer price inflation has fallen from 2.8% in February to just 1.6% currently. Fed Chair Janet Yellen and other senior Fed officials have suggested this is merely a short term 'transitory' phenomenon, but some FOMC members have expressed concern. Neel Kashkari has been the most outspoken, voting against the June Fed hike on the basis that he felt they should wait to see whether the inflation drop was indeed “transitory”. He has since added that it 'actually matters' inflation has been coming up short, citing the Fed's credibility. Dallas Fed President Robert Kaplan is not alone in expressing some sympathy with this view. He suggested recently that he wants to see more evidence that inflation is returning to target before voting for another rate hike. St Louis Fed President, James Bullard, stated that low inflation readings are a good reason "to leave rates where they are". The good news for Fed hawks is that the latest US jobs report offered some hope that wage growth may be bottoming. Average hourly earnings rose 0.3%MoM, the fastest rate of growth since February, and with both unemployment and underemployment at new cycle lows, the shrinking pool of labour may finally start to push pay higher. This is a potentially positive story, but one month of stronger wage growth is not going to sway the market in terms of its thinking for the pace of rate hikes. There are other signs of pressure too. Both last week’s ISM reports saw decent upticks in their prices paid components, while import price inflation has swung back into positive territory after falling 10% in 2015 and 3% in 2016. The dollar’s 10% decline since the start of the year could further boost the price of imported products. The rapid ascent of oil prices in recent weeks will also add fuel to the fire. This week will see the release of the PPI and CPI reports and both look set to show an increase in inflationary pressures. The market is currently looking for headline PPI to rise to 2.3% from 2% (core PPI to rise to 2.1% from 1.9%) while Friday’s CPI report is predicted to show headline inflation rising to 1.8% from 1.6%. We expect it to be back above 2% by the end of the year. 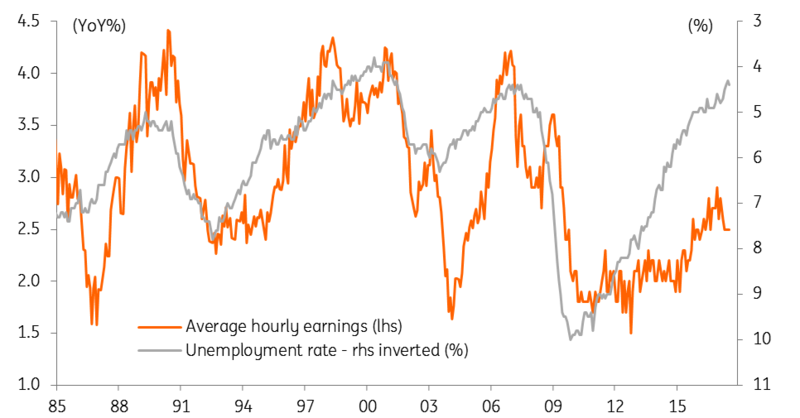 This combination of stronger wage, producer and consumer price inflation could nudge the market into thinking it's pricing of only one rate rise over the next 18 months may be too cautious. Moreover, with the output gap shrinking in the US and inflation widely expected to drift higher, we suspect the Fed will remain wary of leaving policy too loose for too long. With the activity, backdrop looking reasonable and the economy adding jobs in significant numbers, plus the potential for a positive surprise on tax reform, we are looking for a December Fed rate hike followed by two further moves next year.